I feel like doing a bit of chemistry today, how about you? To my knowledge, thermite is the hottest burning man-made substance. Thermite is a pyrotechnic composition of a metal powder and a metal oxide that produces an exothermic oxidation-reduction reaction known as a thermitereaction. Basically, a high temperature burning metal like iron oxide (rust) mixed with an easier to ignite, oxidizing metal will produce incredibly high amounts of heat in a small area for a short amount of time. Thermite is so hot and powerful, that it can even burn straight through asphalt. This is fun for some homemade fireworks, but beware, it's against the law to make incendiary mixtures like this and ignite them. Fill a jar with water. Add a tablespoon of salt to the water. Wrap separate wires around the positive and negative ends of the 9v battery. Stick both wires in the water and see which one makes more bubbles. Take the wire that makes more bubbles and wrap the exposed part to something metal, preferably iron, like a nail, and sink it in the water while removing the other wire. Wait a few days for rust to build up, and scrape it off into a bowl with a metal file. Repeat to your heart's desire. Using aluminum in thermite is great because it has a low ignition point, but burns at a high temperature. This allows for very hot thermite. To get aluminum, you can also buy this from a paint or hardware store, but you might not want to buy them at the same time, in fear of the employees suspecting what you are up to. You can actually grind or cut up plain old aluminum foil if you can't get any power. Try to get the chunks as small as you can. You should have a visual 50-50 mixture of rust and aluminum. Meaning they look like the same amount, but do not weigh the same. Using a very long strand of magnesium ribbon, put it in a pile of thermite, ignite it, and run away. You can use a sparkler, too. Be *very* careful! You could kill yourself if the thermite ignites with you too close. I'd use the mass ratio as the fineness of the powder will affect it's density. Also, I cannot stress enough the fact that safety with this substance should be of the utmost priority. That sh*t melts through iron like it's butter. Temp high is 2.5k degrees. Needless to say if your list of possible applications start and stop with burning through someone's car hood or melting the neighbour's cat, you should not be using this compound. heh, its sooo dangerous. i lit some in a thick metal container with explosives underneath (wayyy out in a field). it exploded in a volcano like way, totally amazing. @Christopher That sounds epic. I would love to try this but I feel like I'm breaking the law just looking at this page. Did you get any footage? Okay some misinformation here, let's try to hit them all shall we? 1) Thermite is not illegal to mix or ignite as long as you aren't doing anything unlawful with it. 2)Thermite should NEVER explode. 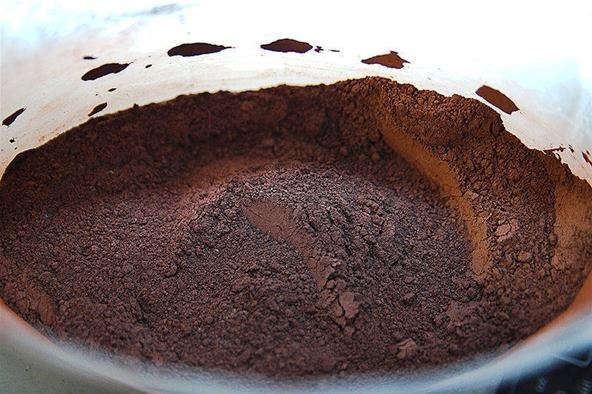 The only time it has explosive potential is when you substitute Iron oxide for cupric oxide, and at that point it becomes more dangerous than flash powder. 3) you don't mix thermite by volume. That's not to say you can't it's just what I was told when I got into pyro stuff, I'm just passing it along. 4) Thermite does not burn at 2.5k degrees F , It burns at ~2300 degrees Celsius or ~4000 degrees Fahrenheit , Those sparks you see are an exothermic reaction burning the aluminum and the oxide and THROWING HOT IRON, While it almost definitely won't kill you it absolutely will hurt. Experience. Remember Thermite itself is not illegal, just don't be an idiot with it. 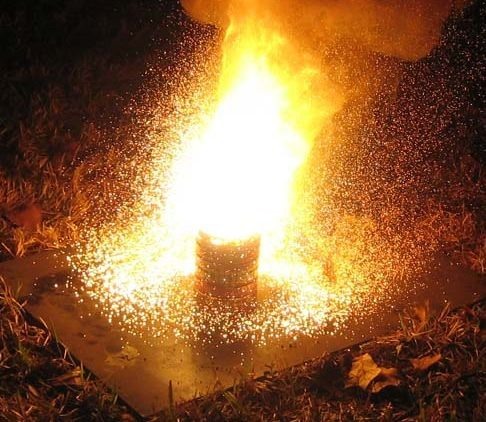 Thermite burns at a miniscule 4,000 deg F.
Magnesium burns at 5,610 deg F.
DiCyanoAcetelyne burns at 9,010 deg F and is the hottest reaction achievable with current chemicals.